A lifetime of experience has made the King of Wands powerful and wise. At the pinnacle of success, his creative energy has only intensified. His forward looking attitude can inspire many. However, others often have a hard time dealing with his intense energy. The King of Wands’ inner circle can be dangerous territory. It’s true that he doesn’t expect you do anything he wouldn’t do himself. The catch is that there are very few people who can hold a candle to him. The King has no patience for slackers. His guiding principles are strength and movement. Sometimes, this means that he lacks compassion for the weak. Crowned and seated in his throne on the King of Wands tarot card, The King can look back on many impressive accomplishments. His throne is decorated with lions and salamanders. Lions not only show his royal status, they also express his strength. Salamanders represent the element of fire on the King of Wands tarot card. You’ll also find them on his yellow cloak. Look closely and you’ll see that in the King of Wands card, they are biting their tails. Forming complete circles, they represent past achievements. In fact they are the Knight of Wands’ completed quests, whose salamanders don’t make full circles. The solar orange color of the King’s throne shows that he hasn’t spent all his energy by a long shot. The live salamander on the ground next to him also symbolizes his great stores of internal power. 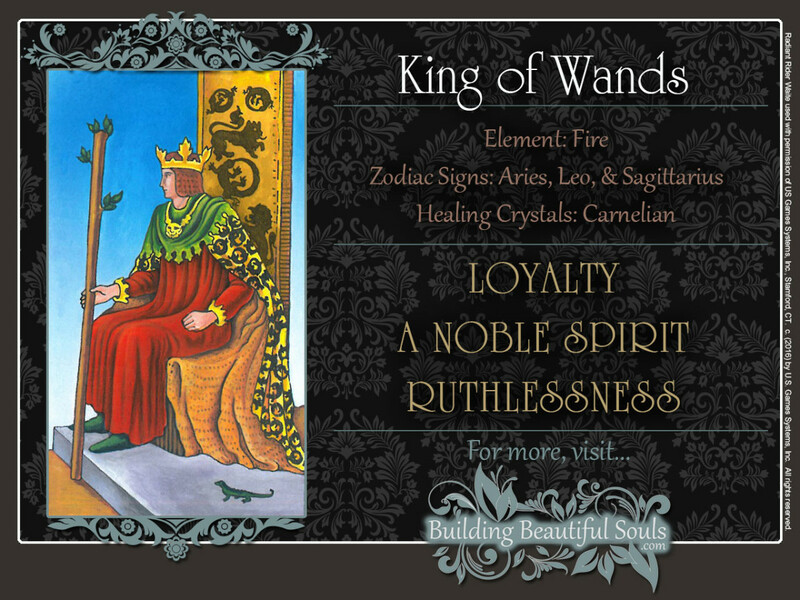 Oh, and did you notice the King’s restless, fidgety posture in the Kind of Wands tarot card? No, he’s not the kind of person who can simply collect his gold watch after 20 years and play shuffleboard in some retirement community for the rest of his life. Yes, the King of Wands has checked every item off his bucket list. But as you can tell from his faraway, intense gaze, he’s already planning out his next list. Here in the King of Wands tarot card, mysterious Scorpio and Sagittarius, who’s always looking for adventure, are searching high and low for unexplored territory. The King’s red robes and green collar symbolize his passion and vitality. The King of Wands’ yellow cloak represents his restless intellect. As the fire aspect of fire, the King of Wands tarot card symbolizes pure heat and energy. This can be a blessing and a curse. Capable of accomplishing greatness, he can also let his temper get the better of him. The King of Wands bristles with creativity, and he is gifted with uncanny foresight. He has learned to trust his instincts, and they have been so finely tuned that they lead him from one stellar success to the next. Widely educated and rich in experience, he keeps his sights on the future and the bigger picture. Details, however, frustrate the King of Wands. They slow him down, and when he skips over them, they can develop into bigger problems. He also has a tendency to ignore past failures – and the lessons he should have learned from them. His many talents and charming personality make him tremendously successful in business. He knows how to present himself in the best light. He has a rare talent for salesmanship. If this is someone who has risen to the top from humble beginnings, he owes his remarkable success to sheer willpower and an unshakable sense of optimism. Looking back, it all seems so easy. That’s why he often has difficulties understanding why others aren’t as successful as he. After all, he managed to pull himself up by the bootstraps. Because everything is crystal clear to him, he can’t wrap his head around the fact that others might not see things his way. When he’s right, he’s right. Everyone else is too stupid or stubborn to see the truth! It’s quite appropriate to call him a “mercurial” man. His temper can turn on a dime. One moment, he’s the funniest, most charming person you’ll ever meet. The next, he’ll spit lightning and fire. This can make it frustrating to be around him for long periods of time. The legendary sculptor Michelangelo was very much like the King of Wands. He dazzled his patrons with magnificent works of art. On the hand, he was also notorious for his angry outbursts. 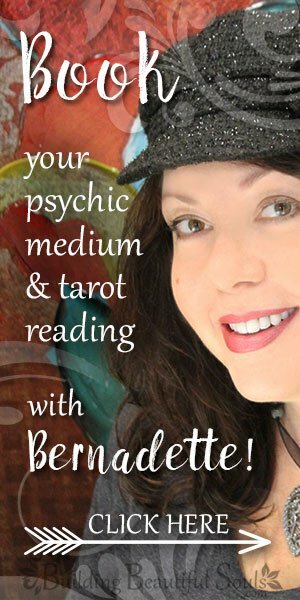 When reversed, the King of Wands tarot card cautions you that you need to pay closer attention to how you come across when dealing with people. While others admire you, they also tend to shy away from you. They’ve probably told you that they are intimidated by your “intensity.” Chances are, you wondered what they mean by that – or what’s wrong with being intense. You certainly don’t mean to intimidate anyone. You’re the first person to admit that you’re energetic and purpose driven. But that’s not necessarily how others may see you. To them, you may seem pushy and manipulative. It’s not really surprising that this is news to you. Trying to look at the situation from their perspective you can teach you to better connect with people. The King of Wands tarot card may also suggest that you’re feeling frustrated about the lack of progress on a certain project. Because others can’t keep up with you, you may feel they’re holding you back. This may or may not be true. But the only way you’ll find out is to step outside yourself and look at the problem from all sides. Your sense of frustration can also be instructive. It could well be that you’re just pushing yourself too hard. Seeking better ways of handling setbacks and delays emotionally will help you grow as a person. Oh, and things will probably run a lot more smoothly, too. Don’t let those minor defeats get the better of you. You can’t make an omelet without breaking some eggs. If you let them teach you wisdom, your power will not lessen. Instead, you will learn how to channel it more effectively. In time, you’ll develop a pretty good grasp on when to use the carrot and when to use the stick. All Kings are associated with the Number 2. Kabbalistically, it corresponds to the sphere of the zodiac. That’s where all major decisions are made. It also suggests an outpouring of immense creative energy that still lacks proper definition. In traditional Numerology, 2 corresponds to the moon and its magnetic pull toward the unknown.